The weather here in our small corner of Normandy has been really strange these past few days. Gales, lashing rain and cold with it, flooding in the fields and our garden ponds are overflowing. 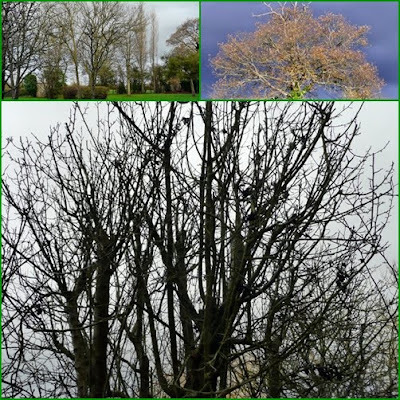 It's the sort of weather we expect... in January & February, not in November!! On Friday we had to chauffeur (ORIGIN late 19th cent. 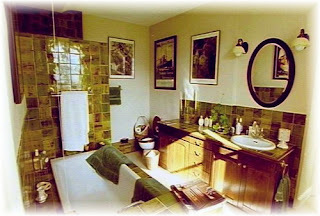 (in the general sense [motorist] ): from French, literally ‘stoker’ (by association with steam engines), from chauffer ‘to heat.’—Oxford Dictionary ) Mr Ben to the "Salon de toilettage canin" for his 9.00 am appointment. The weather turned very nasty as we left the house and soon we were driving through hail which quickly turned into a deluge of ice, very scary. Don't be fooled by the greenery that you can see in the above mosaic, that's mistletoe which sadly has invaded our ancient apple tree. 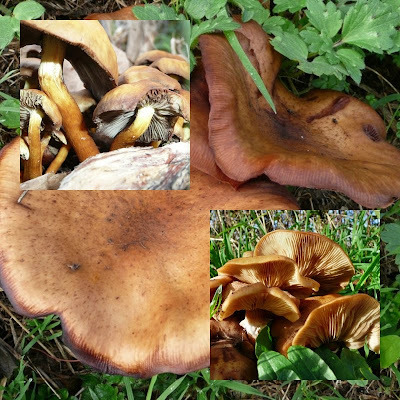 I'll be blogging more about that for Outdoor Wednesday. 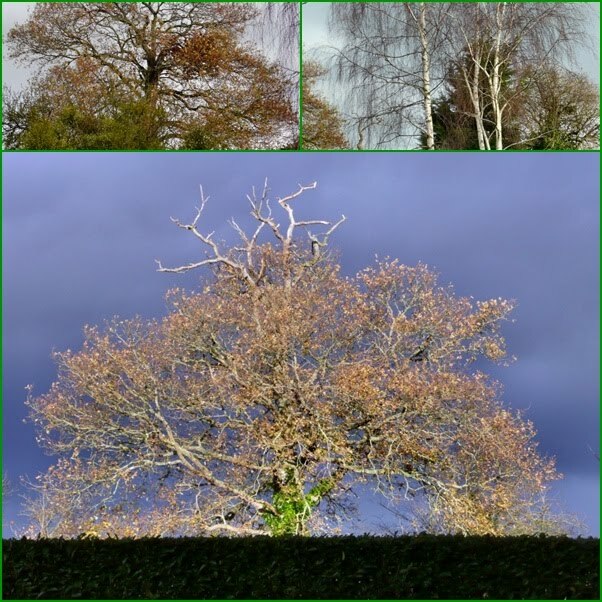 By lunchtime the storm had blown away to be replaced by sunshine & blue skies. My mosaics today are of trees in our back garden, now stripped of almost every last leaf due to the gales, I found the natural light to be quite amazing. Please join me in visiting Mary @ The Little Red House for Mosaic Monday, I wonder how many Christmas Mosaics there'll be? For last week’s Tablescape Thursday I shared our Sunday evening supper table, complete with hot steaming bowls of Hungarian Goulash. My sister Rhonda who lives in New South Wales, Australia and is currently suffering temperatures over 40 degrees C, became quite nostalgic when she saw my TT. I doubt she will ever experience weather cold enough to contemplate making goulash but she has asked me for the recipe and how could I refuse my baby blister? Click here to see what got her all nostalgic. The recipe came from “Slowcooker” by Sara Lewis and so I’m linking up today with Debbie's Crockpot Wednesday @Dining With Debbie. Do call around and say hi to Debbie and read all about the mouth watering recipes that you can make, so easily, with your slow cooker. 1) Preheat the slow cooker if necessary. Heat the oil in a frying pan then add the pork, a few pieces at a time, until it has all been added to the pan. Stir in the onion and cook for 5 minutes until lightly browned. 2) Add the mushrooms and cook for 2 minutes. Stir in the spices and the flour and cook for one minute. Mix in the canned tomatoes then bring the mixture to the boil. 3) Transfer the mixture to the slow cooker pot. Stir in the stock and season with salt and pepper, cover with the lid and cook on Low for 8 to 10 hours. (My slow cooker does not have a choice of settings, it’s on or it’s off! I switched mine on and set it for 6 hours after which I tasted the dish. I then cooked it for a further hour). 4) Spoon the goulash onto plates top with spoonfuls of sour cream and sprinkle with a little extra paprika. 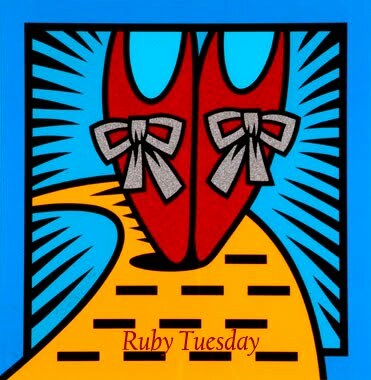 I'm joining Mary the T @ her Work of the Poet blog for my first Ruby Tuesday party because I want to tell you all about a great book, which I have read many times, and is perfect for getting you in the mood for Christmas. Head on over to Mary's for more red gorgeousness. By my favourite author, Fanny Flagg, this real feel good book is "A Redbird Christmas"
Buy it for a dear friend, mother, aunt, sister and an extra copy for yourself, you'll love it! Labels: Books, Fanny Flagg, Redbird Christmas, Ruby Tuesday. Monday has rolled around again all too quickly, many of my friends will be celebrating Thanksgiving this week and Christmas is but a few short weeks away. One good thing about Mondays is Mary's get together @the littleredhouse where like minded bloggers share their mosaics. I'm sure there will be plenty of turkeys on display today but I don't have a single one! 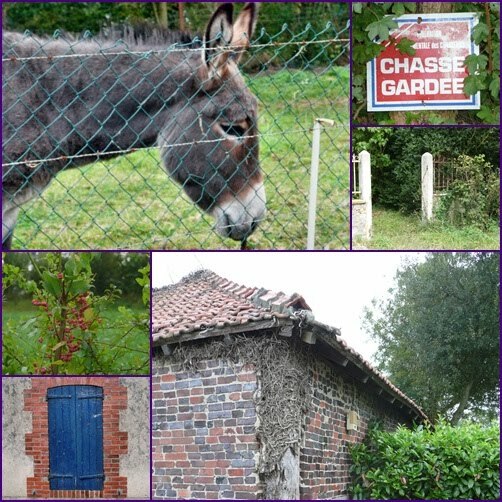 Instead a delightful donkey who lives in my neighbour's garden and is a joy to visit when out on our daily walk around the village. Thanks to Mary who generously shared her knowledge on how to make my mosaics bigger and for those friends who asked Ben last week what sort of camera the Mrs has now it is a Panasonic Lumix DMC-TZ3 with a Leica lens. 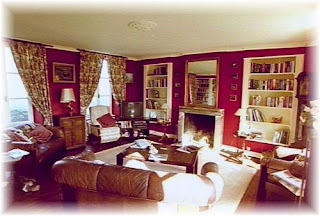 Log fires, tea & books, oh my! A lighthearted quiz I saw recently asked what do you do on a wet & rainy day? My answer was, of course, curl up in front of a log fire with a good book and a cup of tea. 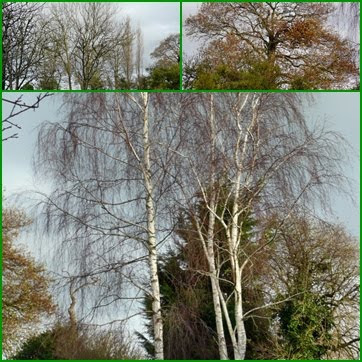 Well, that's the kind of weather we're experiencing here in Normandy this week and it will probably stay like this until Spring next year. Books are on my mind a lot at present and a few days ago I shared with you some of my favourites from 2009. The one keeping me in front of the fire this weekend is "The Guernsey Literary and Potato Peel Pie Society" by Mary Ann Shaffer & Annie Barrows and I'm enjoying reading it very much. 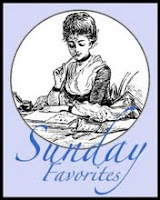 So, for Chari's 31st Sunday Favourites @Happy to Design I'm recycling a post from April this year. Chari is a sweet lady and graciously hosts this Sunday gathering so that we can enjoy blogs we may have missed in the past. "A friend, Sarah from Texas, commented recently on a book which is sitting on my Shelfari Book Shelf at the side of this page, "The Constant Princess" by Phillipa Gregory, a novel about the life of Anne of Cleves. I have read most of Phillipa Gregory's historical novels and have to agree with Sarah that this is one of her best. 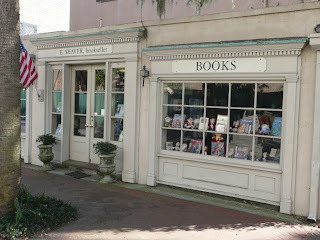 Today I added two new titles to my book shelf, "Midnight in the Garden of Good & Evil" by John Berendt and "More Than Mercer House: Savannah's Jim Williams & His Southern Houses". The book introduces us to a variety of Savannah "characters" the most interesting, in my view, being Jim Williams an antiques dealer who saved and restored over 50 houses in a career that began when he was 24 and which spanned 30 years. Recently we were lucky to have been able to tour the Mercer Williams House, as it is now known, and it is an absolute jewel of a house. On the cover of Berendt's book is a picture of "The Bird Girl" statue which once resided in Bonaventure Cemetery but can now be seen in the Owens-Thomas House, a part of the Telfair Museum of Art in Savannah. " Since I wrote this blog we have been back to Savannah, with our co-hosts Nina & Tom, searching out the best places to show to the QCI members when we gather together there 24 - 27 th October for our Annual meeting next year. Whilst in Savannah we bought copies of both of these books at E Shaver Booksellers and they were auctioned off at the QCI Farewell Dinner Auction in Dallas last month. I'm not sure who the high bidders were but they do have a treat in store when they open their books. Sunday night supper for two. 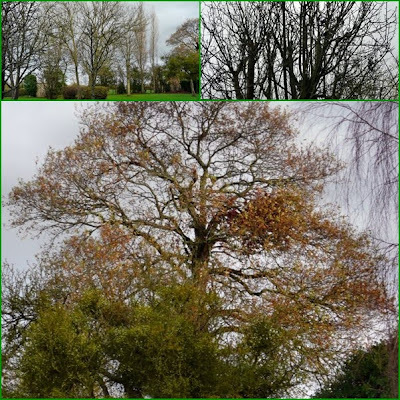 Last weekend the weather turned cold and blustery with gale force winds at times. What could be better on a dark November evening than to set the small table in front of the dining room fireplace, for an intimate supper for two? 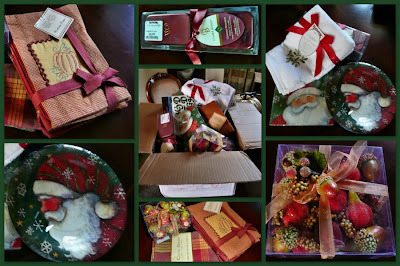 Today I'm joining Susan @Between Naps On The Porch for Tablescape Thursday. If you haven't yet visited BNOTP click here or on the TT button on my sidebar. You will be truly amazed at the wonderful tablescapes featured there. Ivory Church candle in a plain glass vase and pretty opaque glass tea lights with gold decor add a glow to the table. The rust and gold patterned tablemats were a TJ find, the woven place mats a recent purchase at Cora Hypermarket, Caen. A pair of beautifully handpainted Quimper assiettes add colour and vibrancy to the setting. A 1989 Cabernet Sauvignon: Alexander Valley, Simi will go very well with the slow cooked Hungarian Goulash which is on the menu tonight. Pretty tealights and pumpkins add ambience. A vintage French pewter charger sits beneath the large candle holder, fall decorations from Michaels, Bluffton SC. Napkins and napkin rings from World Market also in Bluffton. The white bowls and side plates are from my everyday Cortina by Villeroy & Boch service. A fork and spoon are all the cutlery we'll need for this meal, they rest on vintage French pressed glass kniferests, a Bayeux auction house find. Artisan bread rolls containing noix, lardons and gruyere have been gently warmed to bring out the flavour. It's Tuesday so it must be time for Tam & Diane. 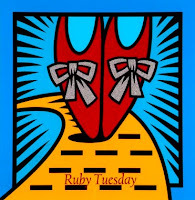 It’s 3 or more Tuesday over at Tam’s The Gypsy’s Corner and so today I’m going to share with you some of the books that I have read this year and the novel (pardon the pun) way that I acquired some of them. Because you see, apart from one, I didn’t actually buy these books, so I’m also linking into Diane’s 2nd Time Around meme too. These ladies do an excellent job gathering us all together to share stories from our daily lives, please do go and visit them and the other participants and say “bonjour”. Like many of you, I am an avid book reader and it’s quite difficult and also expensive to find English language books here in France. My practice for many years was to stock up on reading materials when visiting family bac k in the UK and when on vacation in the States. My sister K.E. also feeds my habit by bringing me books when she visits me here in Normandy. This year she brought me the Twilight series by Stephenie Meyer. At first I didn’t expect to enjoy them but by the end of book one I was hooked, just as she said I would be. One of my favourite pastimes is to spend time browsing the shelves of a book store, especially if it’s a quaint second hand bookstore in the village of Uppermill, which is located either in Lancashire or Yorkshire, UK. (It all depends on whether you are a Lancashire or a Yorkshire lass). However, about 18 months ago I discovered the world of “bookmooch”. This is a place where people swap books. You simply list the books you wish to swop and receive points to “spend” when “mooching” a book from someone else. It is a simple idea and a godsend for someone like me. So far I have received 84 books and mailed out 76!! This is a list of mooched books that I have enjoyed so far this year. The Wedding Officer - Anthony Capella. The Weight of Water – Anita Shreve. Where the Heart is – Billie Letts. Until the Real Thing Comes Along - Elizabeth Berg. The Other Queen – Phillipa Gregory. One book that I tried to mooch, but couldn’t as there were no copies listed, had been recommended by a friend. “American Wife” by Curtis Sittenfeld, so I bought it on Amazon. I just finished reading this book yesterday, Joanne Harris’ “Gentlemen & Players”. Mary @ Across the Pond wrote about this book in a blog last month and mentioned that she thought it would appeal more to British tastes than American, set as it is in an English Boys Grammar School, St. Oswalds. When I commented on the post that I would try and mooch the book Mary very graciously offered me her copy and lovely lady that she is mailed it straightaway so that it was waiting for me here when I returned from my vacation. I really enjoyed Gentlemen & Players, it has a cracking story which I think most people would enjoy but the “Englishness” of it made it a pleasure to read. The twist towards the end took me by complete surprise, although in retrospect the clues were there and I felt slightly foolish for not having spotted them throughout! So, although she probably was unaware of it at the time, Mary started a “Pay It Forward” meme, but with a twist. If you would like to “mooch” Gentlemen & Players from me, go ahead. I’ll mail it to the first person who asks and then let’s watch and see where the book goes next. 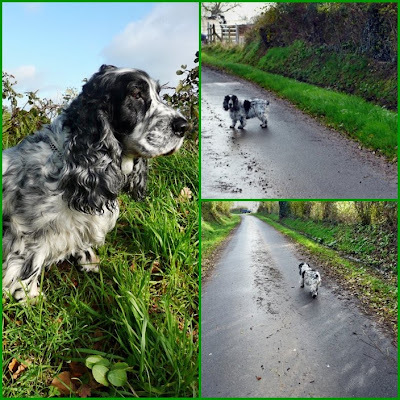 Sunday walk in Normandy by Mr Ben (the dog). Sunday walks are more leisurely than our weekday walks, we try and take a different route just to make it more interesting. 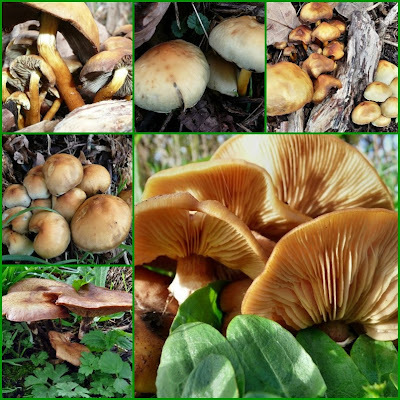 Trouble was, today, Maggie insisted on stopping every few metres to photograph what she called magic mushrooms for her contribution to Mary's Mosaic Monday @ the little red house, so Mr B & I took ourselves off and left her to it. Then she made me pose so that she could photograph me! I'd had enough and headed back to the car, she's really into this new camera. I blame Mary! She gathers quite a group together over there every Monday and they're all great. Check it out. It's almost time for Mosaic Monday hosted by the very talented Mary @ the little red house, please do go over and say "bonjour"to Mary and see all the great mosaics gathered there. I created my top mosaic today using Picasa and the end mosaic using Photoscape which I think I prefer. They are a tribute to Jackie @ "Jackie's Life in Surrey" who seems to have temporarily (I hope) left the blogger world due to a computer gremlin. Recently Jackie blogged about some things she had found at the U.K. equivalent of TJ Maxx - TK Maxx. Those of us who live in mainland Europe don't even have TJ Maxx. But! When I visit SC I always head to TJ's and other stores to buy the products that are either not available over here (you have such a great choice of "stuff" in the US) or which are available here but are a little pricey. Call it my annual fix of "retail therapy"
Last month I bought so much "stuff", not just at TJ's (handbags, Christmas handtowels, Claire Burke candles, Portmeiron votives, Fall & Christmas items) but also Michaels, (Fall decorating items, scrapbooks & supplies) World Market, (napkins & napkin rings) Belk's, (Estee Lauder & clothing) Fresh Market (coffee) & Piggly Wiggly (Zatarans, Hefty bags, etc) and at the first yard sale I ever went to, (tablecloth, Easter decor s&p & more napkin rings) that Mr B insisted on shipping a large box of it home before we left. Well, dear readers as you can see the box has landed! O.K. so what if it cost $75 to ship it to France? It was still worth it! 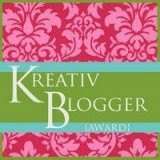 How thrilled am I that the extremely talented Jane @ Mamie Jane's thinks that I deserve the Kreativ Blogger Award? Thank you, Jane, for awarding me this honour. 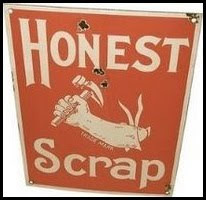 Thanks also to Sam @ My Carolina Kitchen who recently bestowed on me the Honest Scrap award. 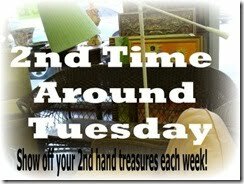 Jane creates some of the most interesting projects, for her home and for sale using flea market & thrift store finds, that you could ever wish to come across. 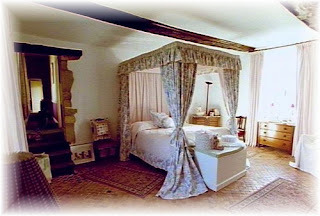 She certainly has an "eye" for decorating and I love to visit her blog to see her new ideas. Sam is a talented writer and food columnist, she is a member of North Carolina Writers Network and her chicken recipes are award winners. Thank you Sam for including me in your list. 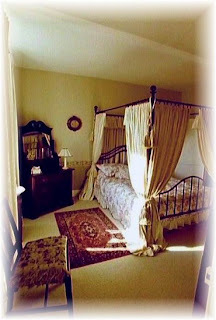 I began my blog in April 2008 just after my dear Dad passed away. 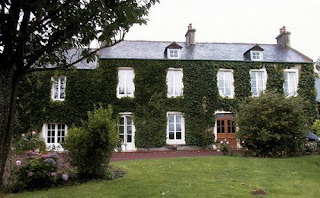 When we first bought this beautiful old house, deep in the Normandy countryside and began to restore it to it's former glory, my Dad often said that I should write a book about our experiences, a la Peter Mayle. 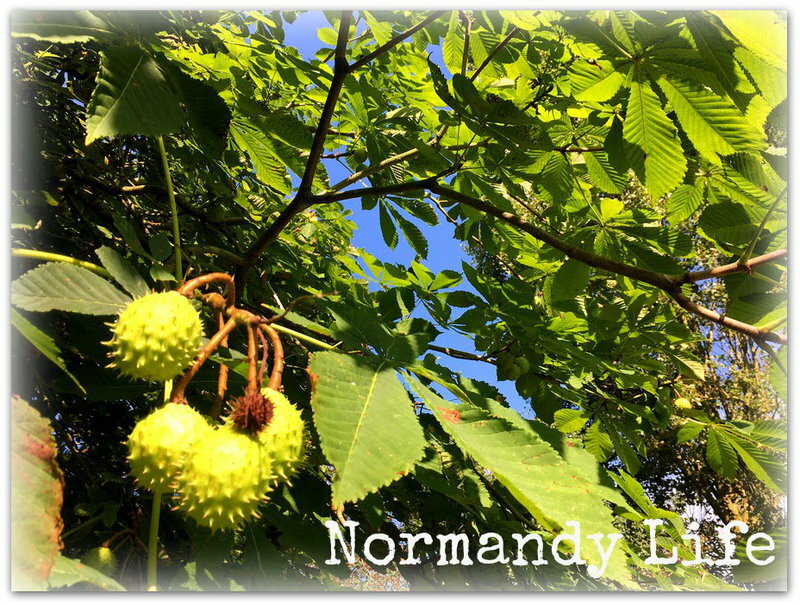 I never did write the book but maybe by blogging about Normandy Life, I'm fulfilling his wish in some small way? It wasn't until quite recently however that I discovered "bloggerland" thanks to my dear friend Sarah @ HyacinthsForThe Soul. 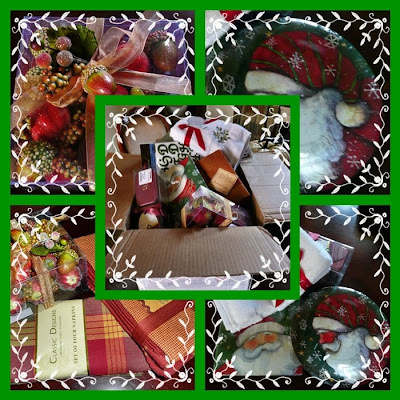 I've so enjoyed visiting the blog parties, Mosaic Monday, Tablescape Thursday, Foodie Friday & Blue Monday just to name a few and who can forget Barb's Rooster Party? I love welcoming visitors to NL & amazingingly 40 of you have decided I'm worth following. Knowing that you'll be stopping by has spurred me on to learn about so many new things. Mosaics in particular have become a wonderful creative outlet for me and I've invested in a new Lumix camera because of that. The rules of the Kreativ Blogger Award ask that I name 7 things about me that you may not know. Honest Scrap calls for me to share 10 but some things need to remain private!! So, what else can I tell you about myself? 1. My first name is Julie. My paternal Grandmother had four daughters and she named them Joan, Jean, June & Jessie. I was the first grandchild and a girl so Nana S wanted me to be a J, too. My Mother wasn't too keen she wanted Margaret, so a compromise was reached and I was baptised Julie Margaret but was to be known as Margaret. I can't tell you how many problems that has caused when filling out official forms & applications over the years! When I was 21 I changed my name to Maggie & now only family members call me Margaret. 2. I can speak German, fluently. 3. When I was 15 I sat on the stage at a Tom Jones concert and he sang "What's New Pussycat" to me whilst holding my hand. 4. In 1970, early one morning as I walked to work along an empty stretch of road, a limousine drove by and the lady inside waved to me. It was Queen Elizabeth II who was visiting the City of Manchester that day. 5. I have 2 sisters and one brother. Rhonda and Jonathon who both live in Australia and K.E. who lives in the UK. 6. I cannot swim and have a pathological fear of deep water. 7. Since we married 30 years ago, Mr B and I have shared our lives with 3 German Shepherds and 3 Cocker Spaniels. Bosun & George. Bella & Blue. Bess & Ben. 4. Mary @ Across the Pond. 2. Copy the logo (s) and place them on your blog. and finally thanks once again to Jane & Sam for being so thoughtful. 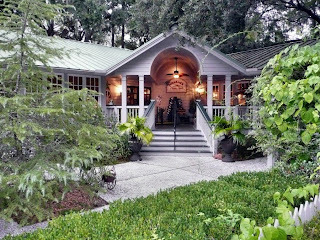 3 or more Hilton Head restaurants!! I know, I know............. it's almost winter and here I am still banging on about Hilton Head! But you see I won't be going back there until next October when we'll be co-organising the QCI 11th Annual meeting in Savannah. Some of you lucky people might get there before I do so I wanted to share with you and Tam's 50th Three Or More Tuesday @ The Gypys Corner,our favourite HHI restaurants just in case you'd like to try them too. 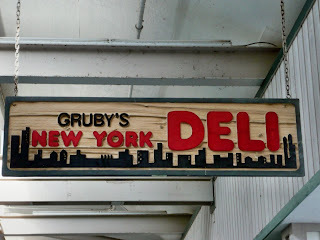 There's only one place we head to for breakfast or an early lunch and that's "Gruby's New York Deli". Split the NY Reuben you won't be sorry. 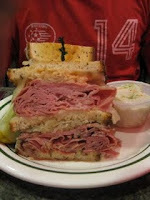 Since I wrote this blog earlier today NM has come visiting and asked what is a Reuben, guess they don't have them in OZ? A casual relaxed place for lunch? 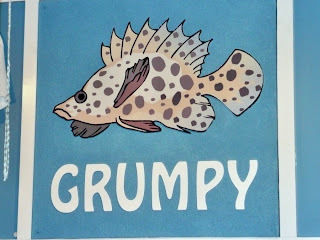 Then you won't go far wrong with "Hudson's on the Docks" or the "Grumpy Grouper". Want something quirky off island? 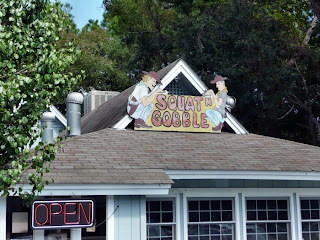 You have to head to Bluffton and experience the "Squat & Gobble" restaurant. 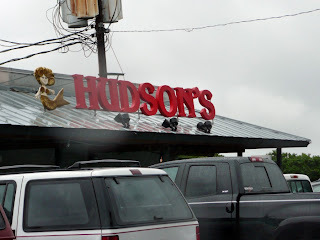 The food is excellent and it was packed when we went. I'm not saying another word, go see for yourself. 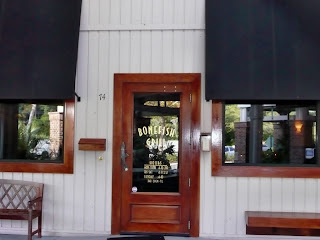 For casual fine dining we always like "Bonefish". And maybe I'll regret telling you about this "find" but a new place to us this last trip was "Charlie's L'Etoile Verte", a Hilton Head insider secret for over 25 years, I have no idea how we missed it all these years but it's a keeper now. They have Quimper faience hanging on the walls! Please visit Tam @ The Gypsys Corner and all the great blogs gathered there today.